The Scratch Layer is a special layer that can be used for a variety of purposes. It is designed to be very easy to access and use. Common uses are for mixing colors, trying out brushes and creating quick clips. Click here to select the Scratch Layer. Notice the Scratch Layer in the Layers panel is not currently active. Notice here in the Layer Mini bar that the Scratch layer is selected. Also in the Layers panel the Scratch Layer is shown as the selected layer. 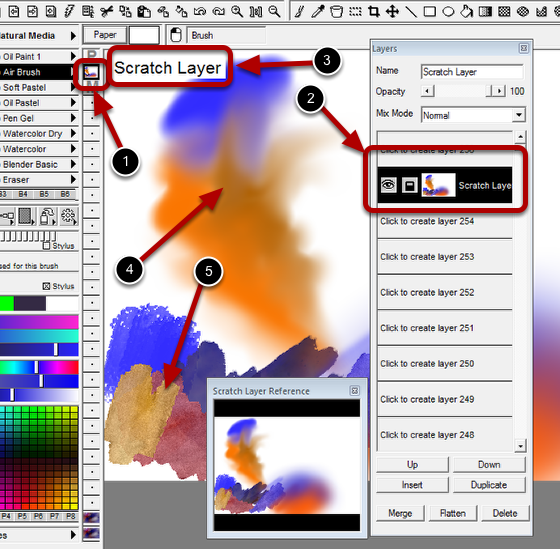 The label "Scratch Layer" is shown here as a reminder that this is the scratch layer. 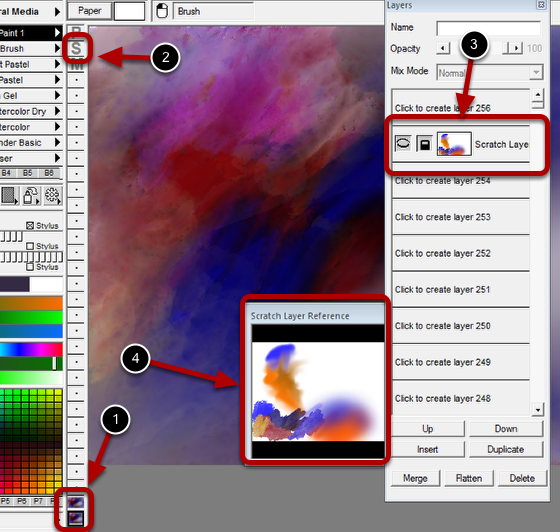 Use any brushes, tools and filters to paint on your scratch layer. Here some brushes were tested and tweaked before being used on your actual image layer. Select your working layer again to exit the Scratch Layer. After you exit the Scratch layer a Reference Image will automatically be opened to allow for easy color selection. Clicking on your working layer will exit from the Scratch Layer mode. Notice the Scratch layer icon in the Layer Mini bar has returned to inactive. Also notice that the Scratch layer in the Layers panel is now hidden but remains for future edits. The Scratch Layer Reference panel is automatically shown and updated with the scratch layer contents. 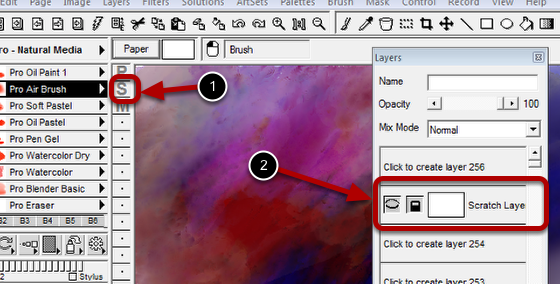 This allows for easy color selecting which is especially useful if the scratch layer is being using to mix colors.